Alright, so it’s the first day of September, but I’m not letting go of summer just yet. Yes, it’s been a doozy of a flipping summer. Busy AF. But also sunshiney. And just full-on Chicago, which is my favorite kind of Chicago. But back to the busy part. See, I’ve been muddling through a busy work schedule, while trying to budget better, eat better, workout more frequently, train my dog, keep on my Goodreads..and my shows…You get the picture. I needed a little help on the baking front. And the blogging front. Because, if you couldn’t tell, I haven’t been blogging much (AGAIN) lately. And while I’m not the best at asking for help when I need it, I did this time. And I asked it from literally the best person possible: my baby sister. Or, at least Kimberly’s recipes! While I like making and baking healthy type meals like warm apple “desserts” or protein-packed burritos or Whole 30-approved protein balls (and, of course, a cookie cake every now and then), Kimber is the real chef of the family. Legit this girl has been whipping things up and experimenting with food for as long as I can remember. So I’m super excited to see what she brings to the table (literally). First thing she’s dishing out? 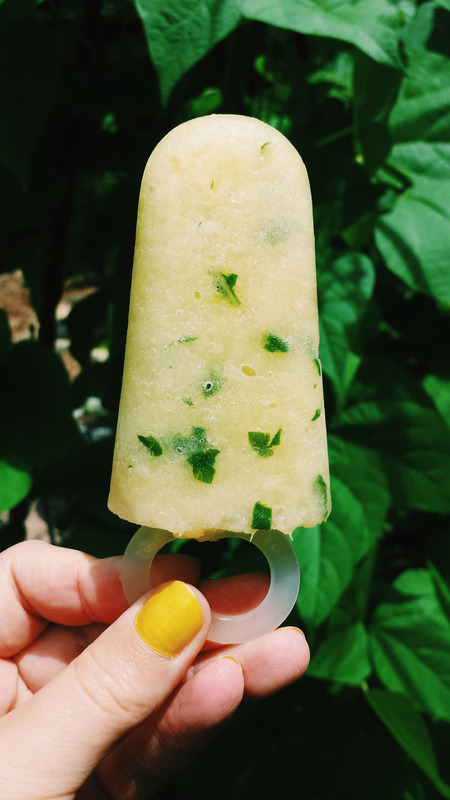 This delicious pineapple basil popsicle recipe! Just look at that icy fresh goodness. Like I said, we’re not letting go of summer just yet. 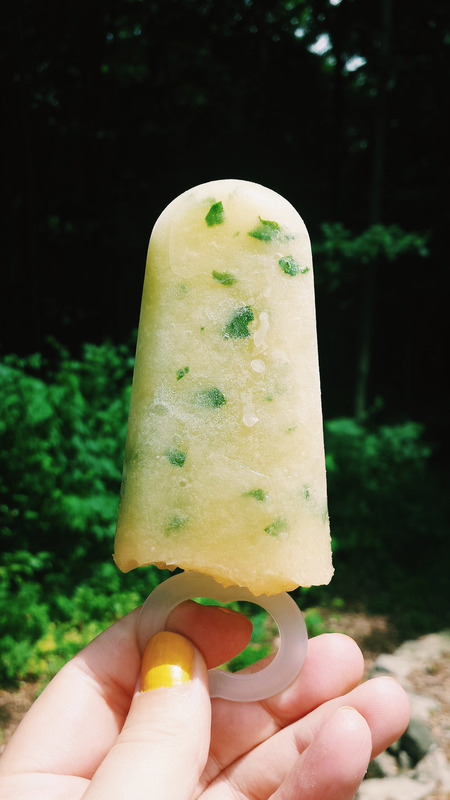 Whip these up for a super healthy, refreshing Labor Day treat and embrace the few rays of sunshine we have left. Enjoy! Healthy way to enjoy a fresh summer treat. Wash and roughly chop the basil leaves. Put the basil leaves in the blender along with the entire can of pineapple. 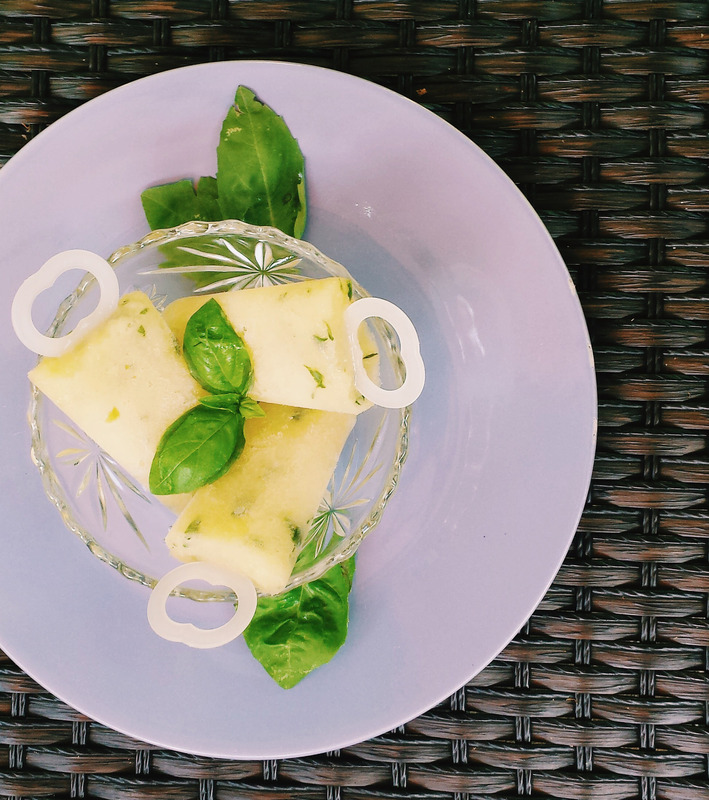 Blend the two ingredients until the basil has fully mixed into the pineapple around 1 minute. 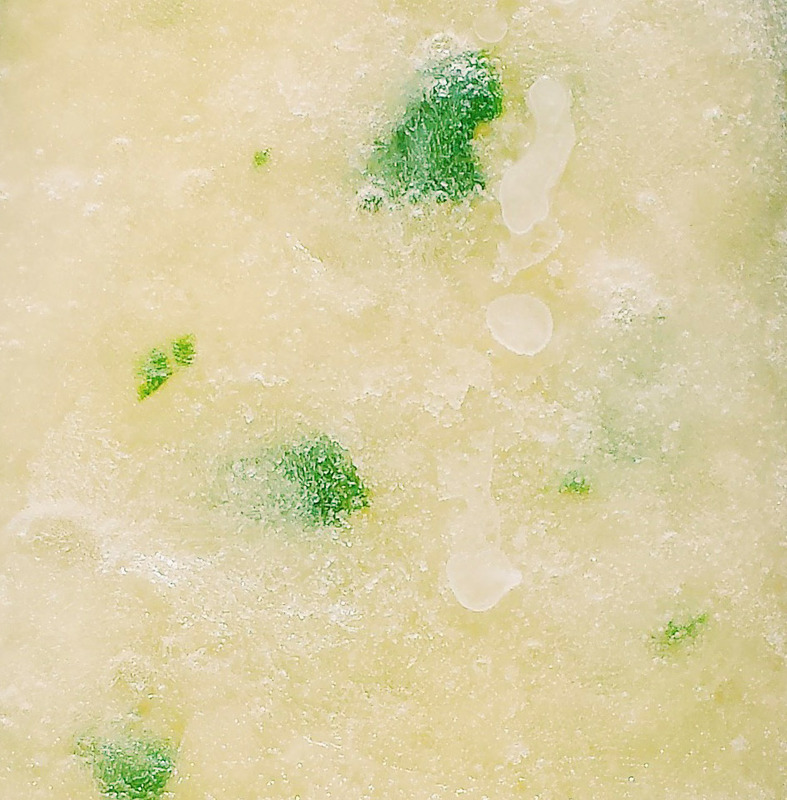 Pour mixture into popsicle molds and freeze fully. Enjoy! Okay, so “chocolate” is a bit of a stretch, but still technically true. See, there are cocoa nibs in these little delicious bites. And cocoa nibs and cocoa powder are technically allowed on the Whole30 plan, as long as you’re not consuming it to meet a sugar craving (which, hand to my heart, I am not…really mom, I’m not!). I was inspired to make these after trying a recipe by Chocolate Covered Katie that I’m now having trouble finding. Womp, womp. Sad face. So, I whipped these up instead and they turned out pretty darn good. Also, there’s a sh*t ton of protein in these suckers, obviously, which keeps them both filling and delicious. Double trouble. Can I also say that though I feel lighter on this Whole30, I’m missing bagels like no other? No idea why, but all I want is a big, thick bagel with some schmear. Blergg..21 more days. Any who, these little balls (ha, balls) have been my saving grace. Did I mention the puppy is a lot of work? Did I mention that I also have had appointments mixed with travel mixed with work mixed with puppy mixed with brit.co mixed with trying to keep sane? Oh, I have? Sorry. Obviously, I’m burning the candle at both ends and hoping I don’t trip and set fire to myself. Though, knowing me, I probably will. Okay, Nicole. Focus. Balls. 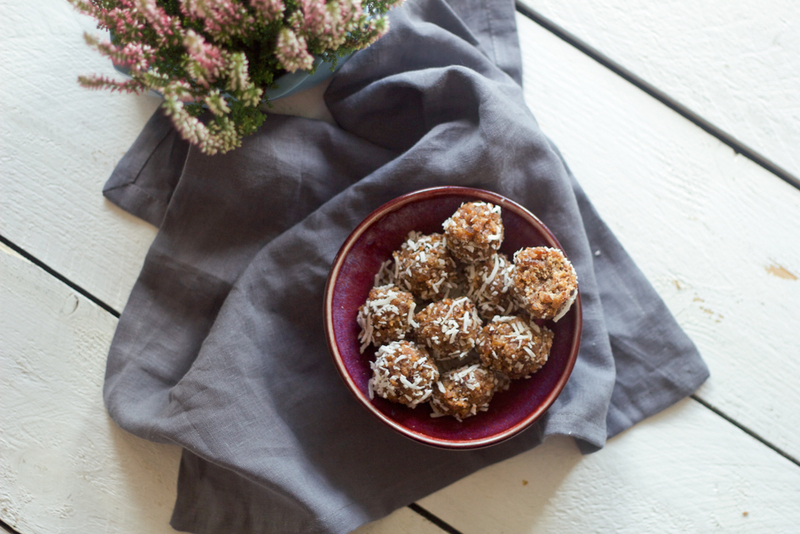 Below you will find a delicious recipe for deliciously filling protein balls and the major awesome thing about these? They’re actually fast to make. I made them in both my Nutribullet and my food processor, and I actually preferred the Nutribullet–would just makes clean up even easier. So many wins. 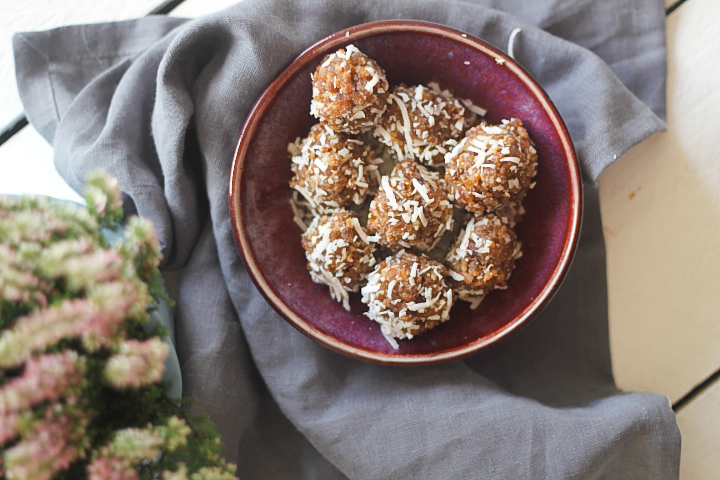 Delicious little bites to keep you fuller, longer. 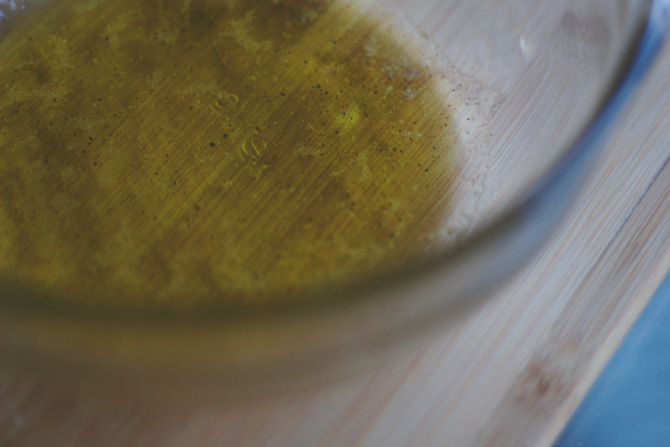 Note: If you're using coconut butter, don't include the coconut oil. 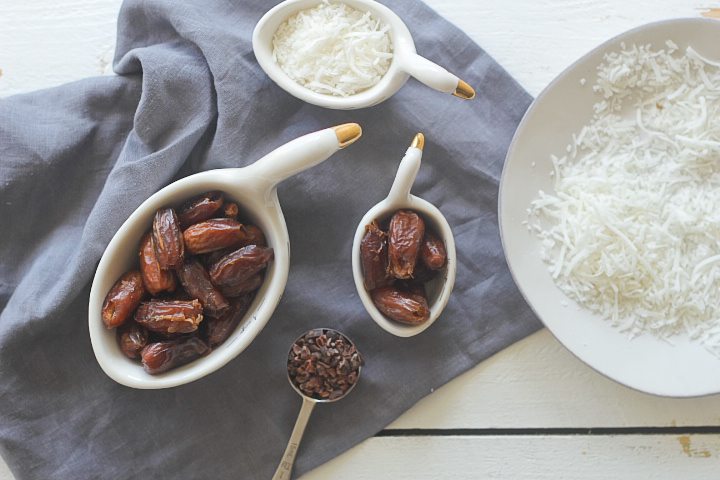 Mix ½ cup coconut shreds with 2 tbsp coconut oil. I've found it's best to mix it in a powerful blender, like a Nutribullet. 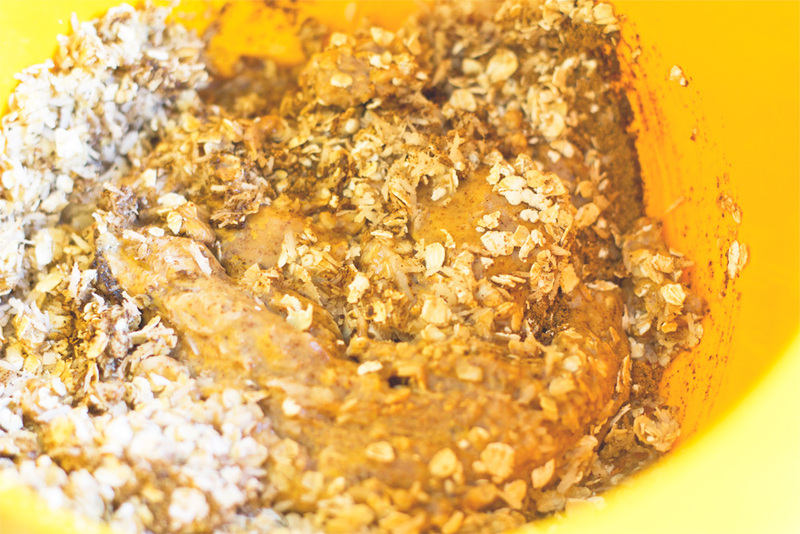 Perfect consistency would be creamy, but even if it's the consistency of almond meal, I've found it still works. Another option? Just use ⅓ cup of coconut butter. Add medjool dates and almond butter. Blend. Once thickened to an almost dough-like consistency, stop. Take out and roll into little balls. 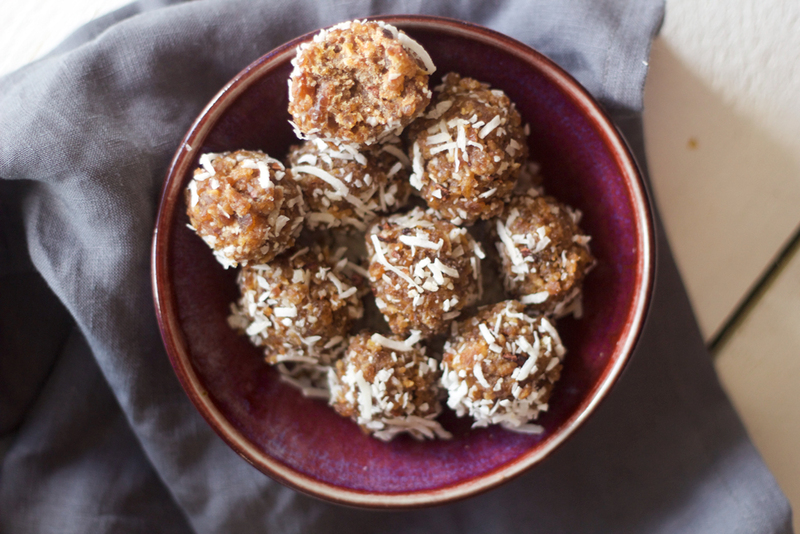 Then, roll balls around in more coconut shreds. Set in refrigerator for at least an hour to harden. These should keep fresh in the fridge for up to a week...if they even last that long. Also, #tbt. Just cuz I’m gettin’ those #fallfeels. When you’re trying to tone up, everyone always advises you consume more protein. While, I believe it’s up for debate how much protein is healthy to consume (honestly, how much is too much? ), protein is an important part of toning up and shedding pounds. Not only does it keep you full longer, so you’re not randomly snacking on junk, but it helps repair and rebuild the muscle that’s broken down during an intense workout. So great. Protein is awesome. Except I’m not one to gobble chicken breast on the daily. 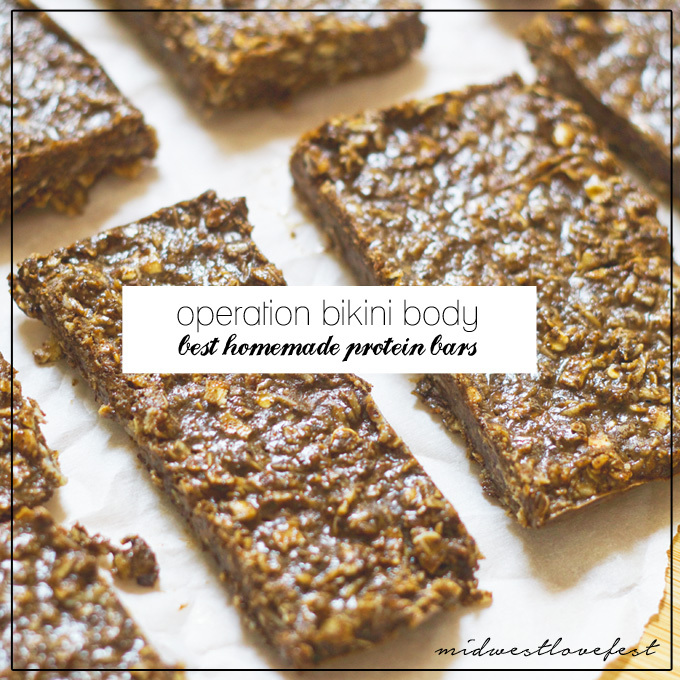 Sure, it’s a versatile protein (bake it, shake it, cook it etc. ), but really…I need some variety. 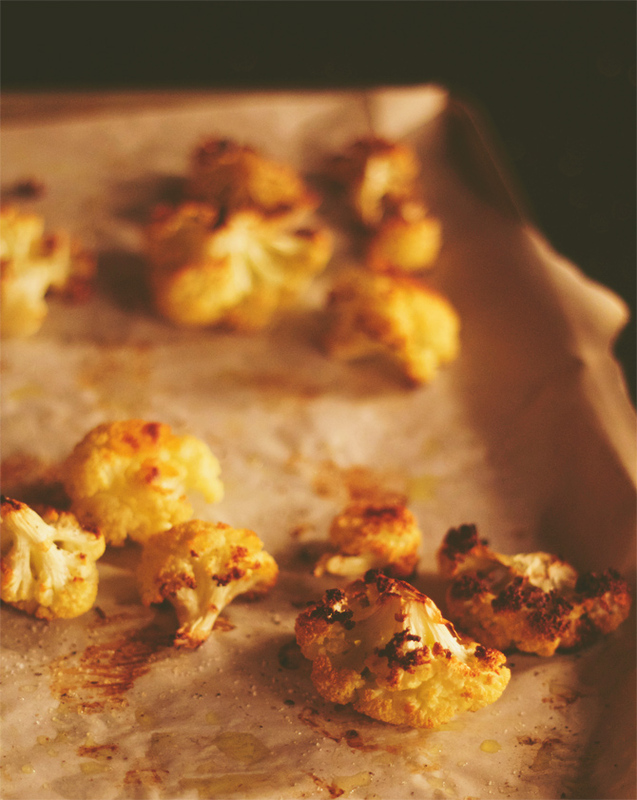 Enter this wonderful recipe (originally posted on Fitnessita). Now, I’m already pretty damn picky about the snack bars I pick up from the store. I mean, have you ever checked the label on the backs of those things? It’s like a mini dictionary, all those wacko ingredients. But I admittedly don’t enjoy making my own bars at home. Every blogger is like, “Blah, blah. They’re SO easy! Granola and coconut and yum!” But I’ve never had them turn out as good as those bloggers claim. But…I swear to you, this recipe is different. This has become my go-to bar. 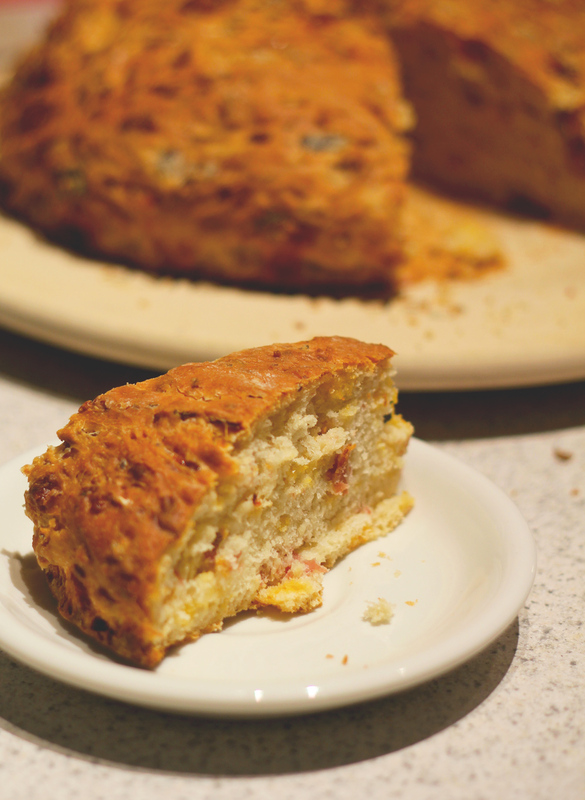 The ingredients are simple, pure and delicious and the recipe is super-duper simple. I’m talking 5 minute simple. Plus, I’ve discovered it’s a difficult recipe to screw up. And, trust me, I’d know. 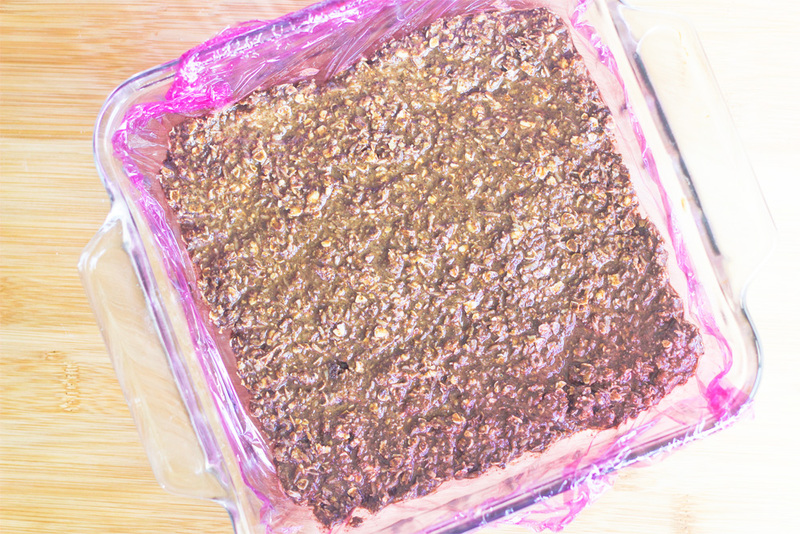 There’s no baking involved, so all you need to do is nab the right ingredients, mix them together, throw them in the fridge and cut them into individual bars. You can also add an “optional” chocolate drizzle on top. I did this for my first batch, but discovered (on my second batch) that it wasn’t even necessary. The bars were perfectly decadent all on their own. Though, it’s ultimately your call if you want the added sweetness. 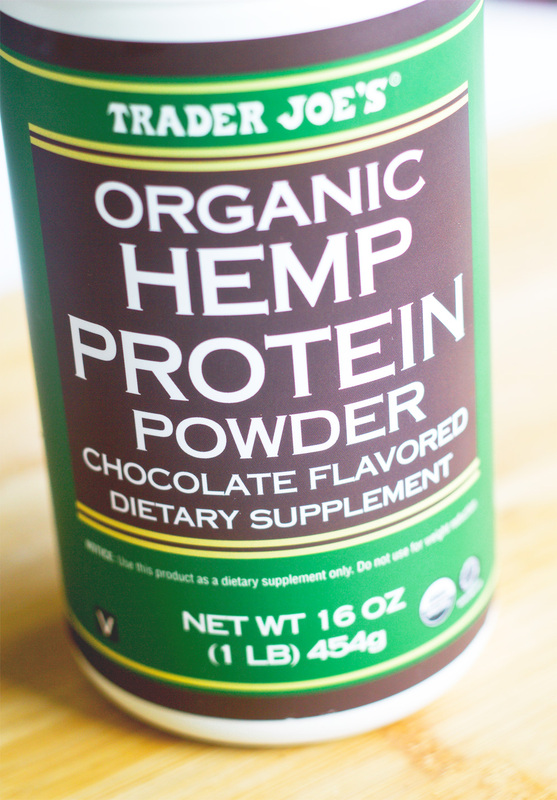 I do recommend the Trader Joe’s chocolate hemp protein powder I used. I’m not a huge fan of whey powders (just a personal preference), but I also have difficulty with a lot of the additives of most vegan protein powders. So I took a gamble and won out on this tasty, plant-based alternative. 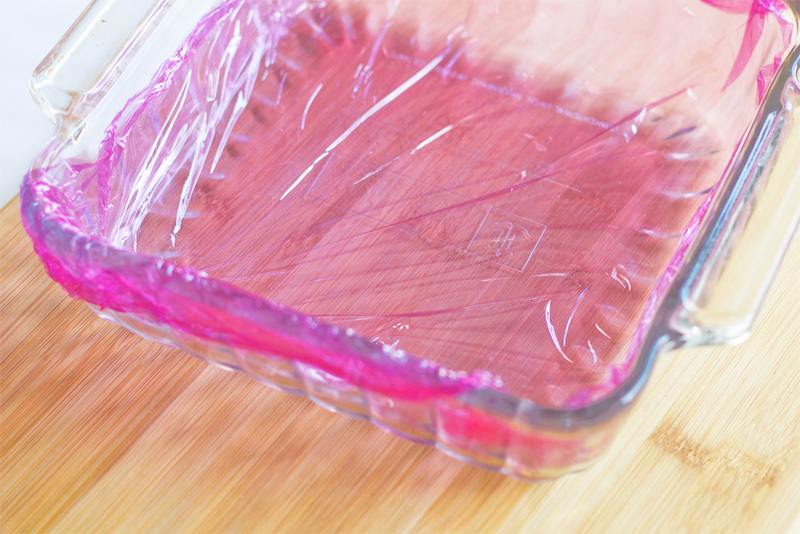 As far as making the bars, you can either use parchment paper or plastic wrap. I preferred the plastic wrap because it conformed more easily to the glassware. 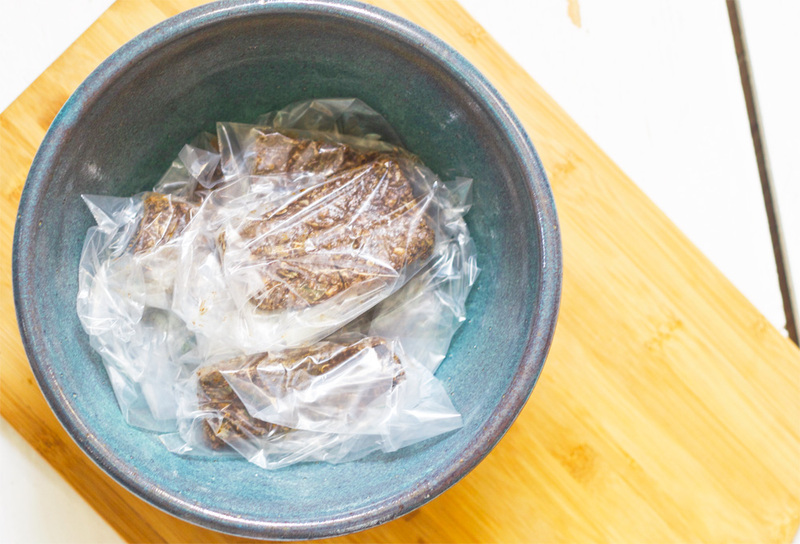 Once you’ve laid out the plastic wrap and poured the mixture in, throw the whole thing in the fridge for an hour or more (I just went for a walk while I waited). Then, slice them into bars and boom! Dunzo. 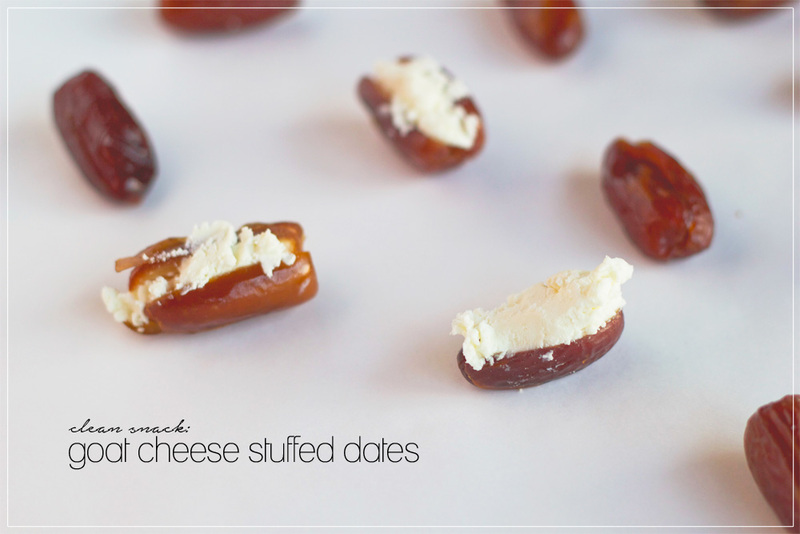 Store them in the fridge (in little plastic baggies or wrapped in plastic wrap) and grab them on the go. I figure they would keep for about a week or so, but I devour them so quickly I’ve never made it through a full week to actually know. Another plus side to these bars, they are extremely filling. Just make sure you don’t leave them out of the fridge too long. They will melt and literally look like poop (I found this out when I left one in my purse). In non-related-to-protein-bar news, Ryan returned from Portland Monday and left for New York this morning. SUCH a jet-setter. Makes me want to travel SO bad (I know you care about these random things in my life (ha), so I thought I’d mention it). 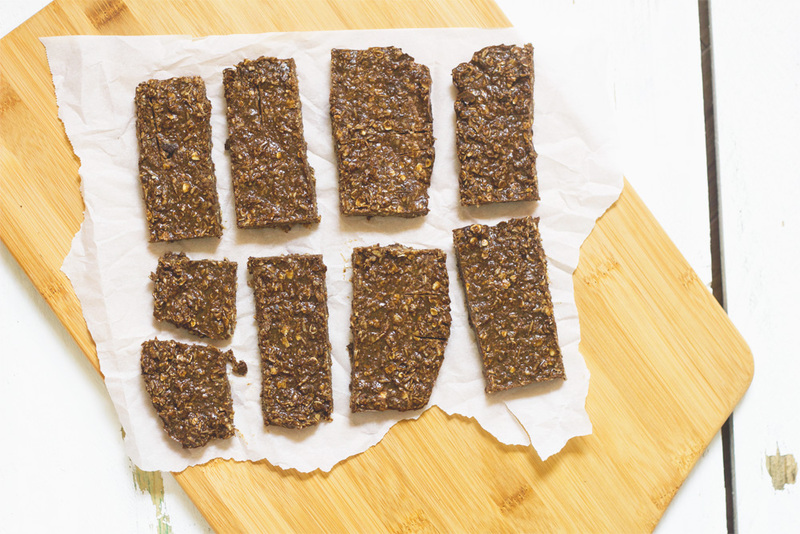 What’s your go-to protein bar? 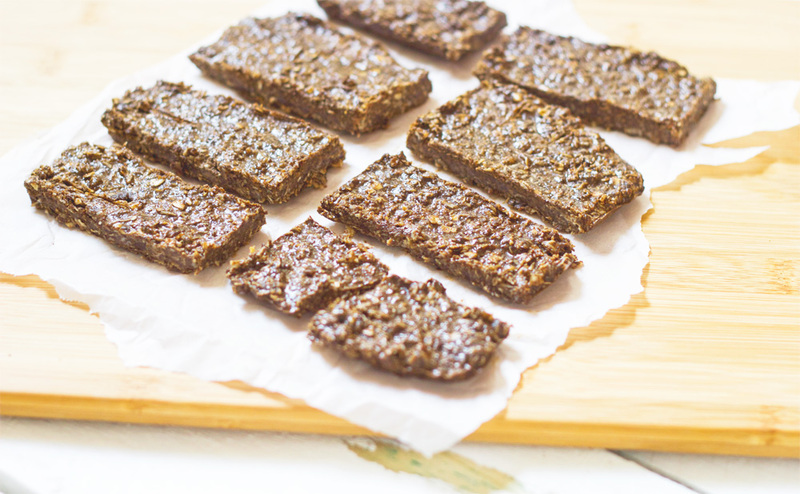 Aside from this homemade one, I’m obsessed with the snack brand KIND since their ingredients are a bit more on the pure side. Have any other recos? First off, sorry for posting this a little late. If you follow me on Twitter, you probably saw I was stuck on a bus for over an hour this morning after Chicago went crazy. I won’t get into details, but let’s just say one bus caught fire (luckily not mine) and possibly two trains? Oh and two lanes were iced over and closed. Normal Midwestern things. Anyway, getting on with it! 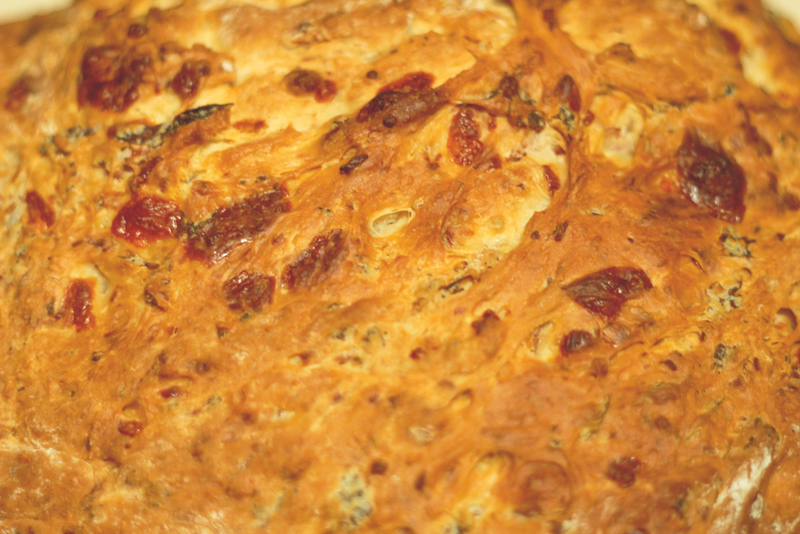 If you couldn’t tell from my slightly Italian-themed fritatta, I am really missing Italian food. Maybe it was because we were so busy and relaxed, or because we didn’t think about food or stress about much, but somehow with all the pizza, carbs and wine, I still didn’t really gain much weight on our honeymoon. But I also think a big part of that was because Italians eat so clean and simple. Just basic cheeses, meats and breads. Gah! I love it. This bread was one of my favorites from our honeymoon. It was served every morning at the bed and breakfast we stayed at in Praiano. I missed it so much, I emailed the hostess weeks later, requesting the recipe. Luckily she understood what I was getting at (“You know that breakfast bread? It was round and really heavy?”) and was kind enough to share it! As a bonus, this bread is also great for a Thanksgiving spread because it’s hearty and huge, so it can serve a lot of people. Also, it’s filling and beautiful. Just look at those insides! I had to adjust the recipe a tad, since their recipe was very…unspecific. But it still turned out, so yay for guesswork! 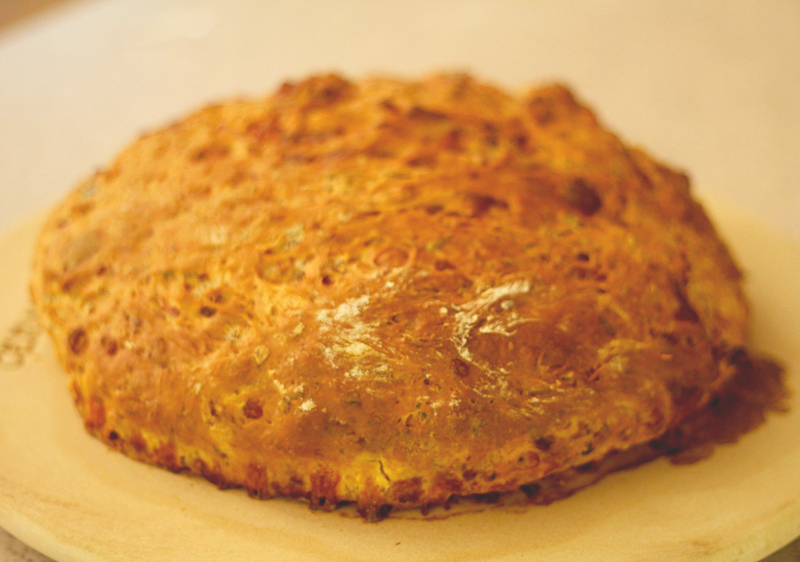 One more note, when kneading the bread, even if it’s sticky, be sure not to add too much flour. Always just add enough flour that you can roll it into a ball. I served this to my family over the weekend–you know, bringing a bit of our Italian honeymoon to Appleton–and they thought it needed more salt. Which Ryan and I found funny, since it tasted exactly how it did in Italy. Americans are just use to more salt (and sugar) in everything. But, if you do want to be add more salt–I recommend buying the heavy salami or adding more salami to your bread. Should do the trick. 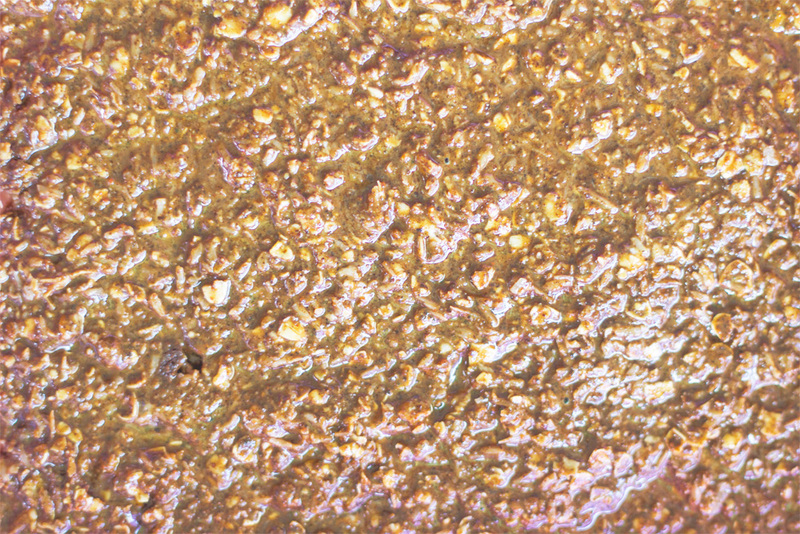 Place on floured surface and knead. Add more flour to form a ball. Put in a bowl for an hour and let it "grow." Once it has grown, re-knead it and let it grow again. Once it has re-grown bake for 50 minutes at 335F (170 C). Do not open the oven in the meantime. 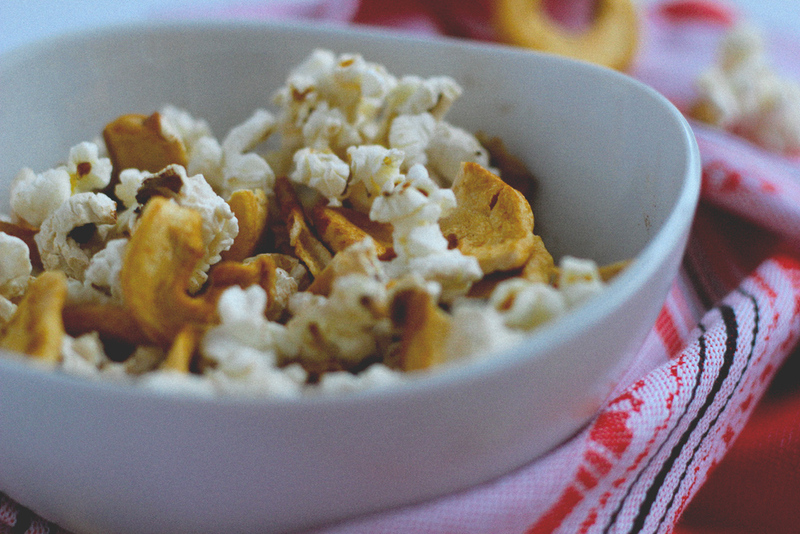 I really hope you guys enjoyed yesterday’s recipe because today I’m bringing you another popcorn trick! I don’t understand the point…shouldn’t it just be popcorn kernels, a bit of oil and some butter? I guess I’m taking crazy pills here. Anyway, getting back to wherever I was, this brown paper bag method still yields the same results as the pot/pan method, but it’s also perfect for those lazy nights when you couldn’t fathom cleaning another dish or lifting a finger. 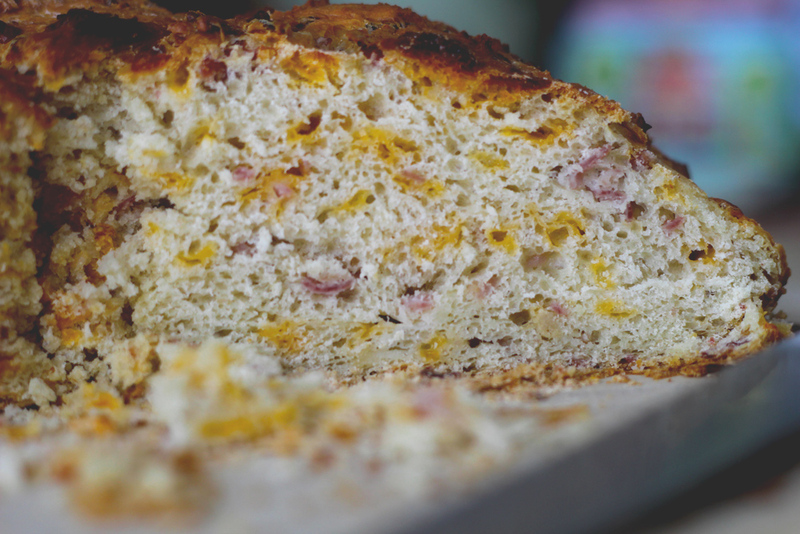 I used this recipe as a starting point and adapted it for some seasonal fun. I used 1 tbsp coconut oil (instead of vegetable oil), coated the kernels, sprinkled some sea salt (didn’t measure because I didn’t want a lot of it) and threw it all in a brown paper bag (which I very tightly rolled close). Once the popcorn was done popping, I took it out and sprinkled some cinnamon on top, mixing well. 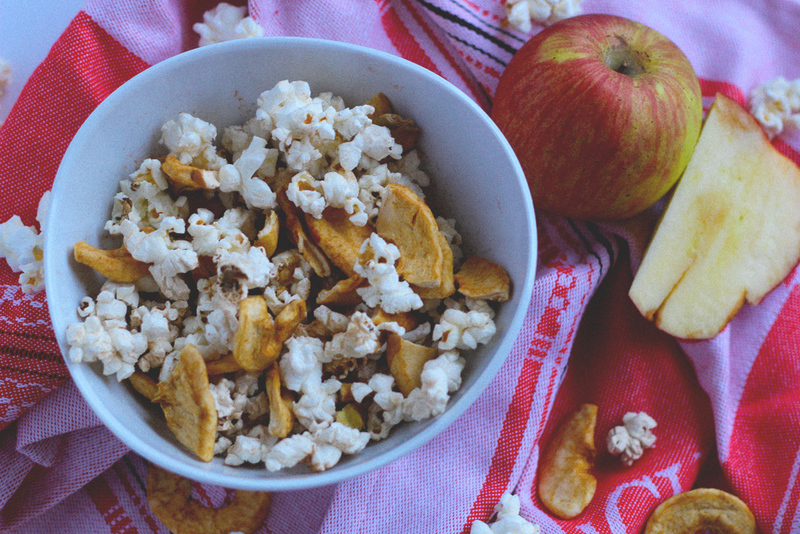 Then, I took a few dried apple slices (I used Trader Joe’s New Zealand Sweet Apple Rings ), tore them into smaller pieces and added them to the popcorn. Finally, I mixed the medley! Now, you might notice the cinnamon popcorn alone is not very sweet, like at all. This was intentional. 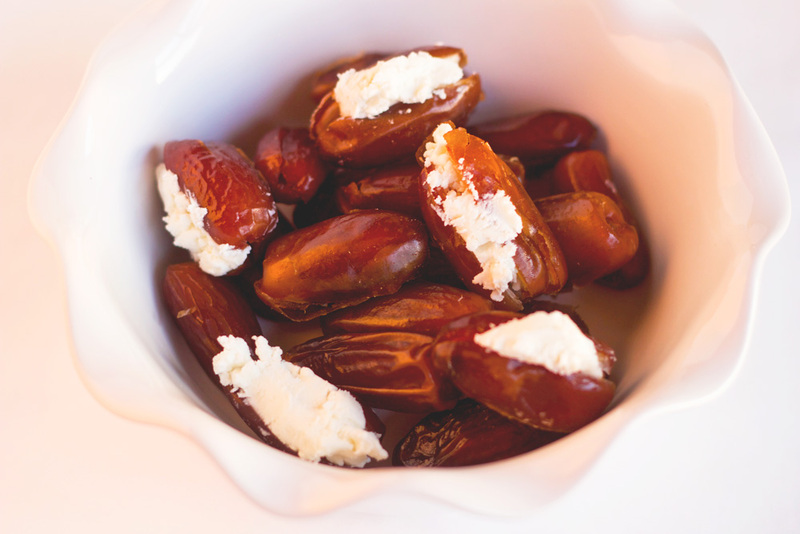 Dried fruit has a lot of concentrated sugar which, though it isn’t the best, is still a healthy snack alternative. But this also meant that the fruit would counteract the slightly bitter popcorn kernels. 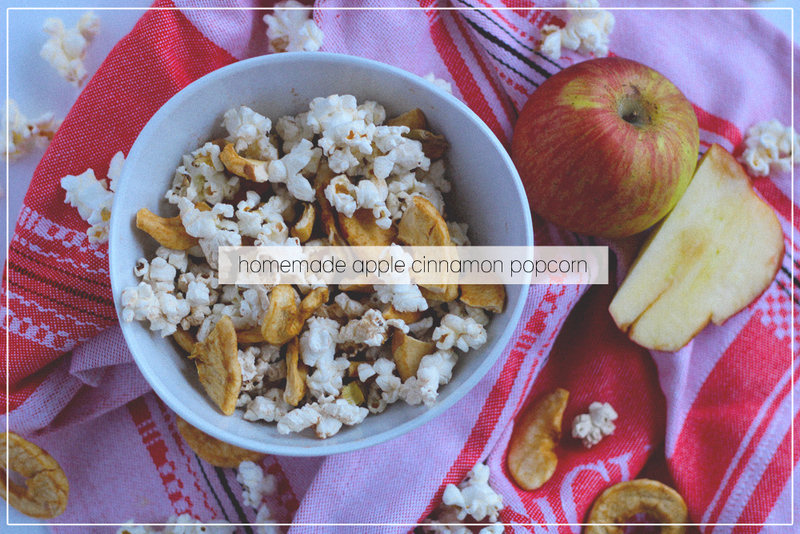 However, if you do want that sweeter taste, I recommend using yesterday’s popcorn recipe as a base and then adding the cinnamon and apple pieces. Doesn’t that look just b-e-a-utiful!? 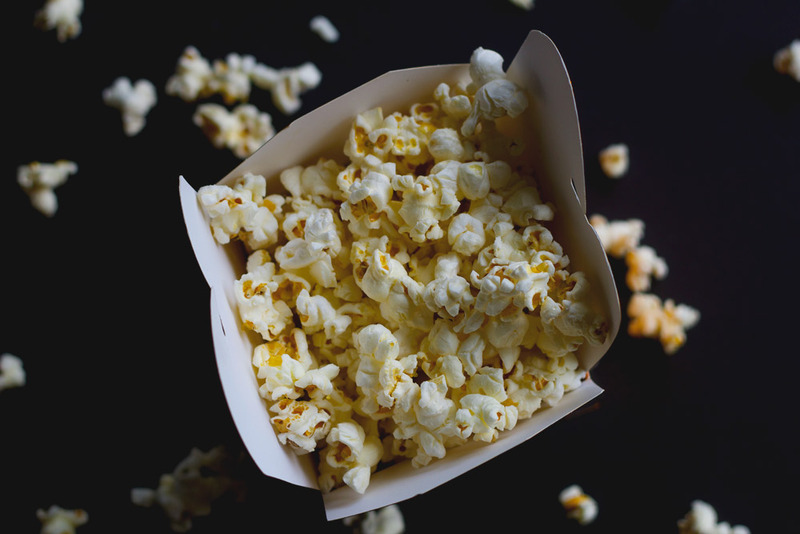 That’s the type of microwave popcorn we should always be enjoying, right? It’s American Horror Story Day! I’m sorry, but I’m allowed to get abnormally excited about a horror show when Halloween is happening in a few weeks! If you’re not familiar with American Horror Story, this season the plot/theme is Freak Show. The bearded lady, siamese twins, an evil clown, they’ve got it all (gosh, I sound like Stefon). It’s this freaky freak show that inspired me to share today’s treat. 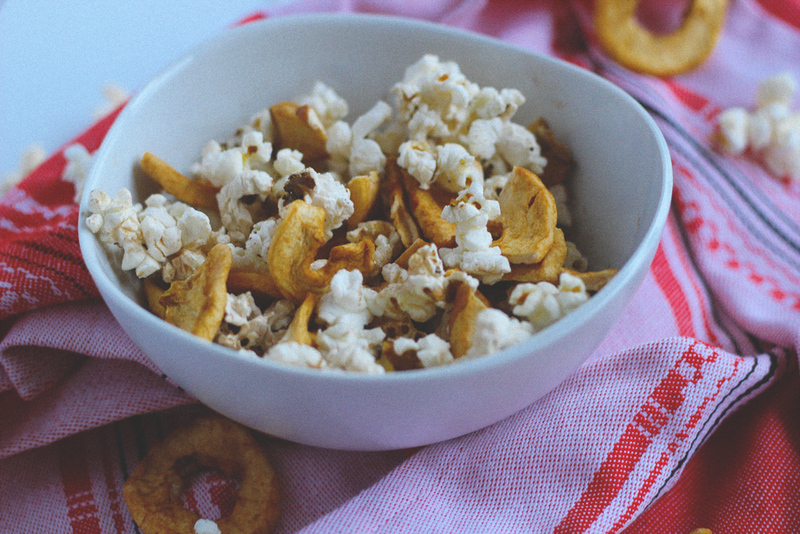 A healthier version of your fave carny snack: kettle corn. First off, kettle corn is one of Ryan’s fave snacks, period. So it’s always lurking around on the daily anyways. But since I’m slowly trying to weed out all his bad snacks and replace them with better alternatives, I thought I’d go ahead and give homemade kettle corn a try. 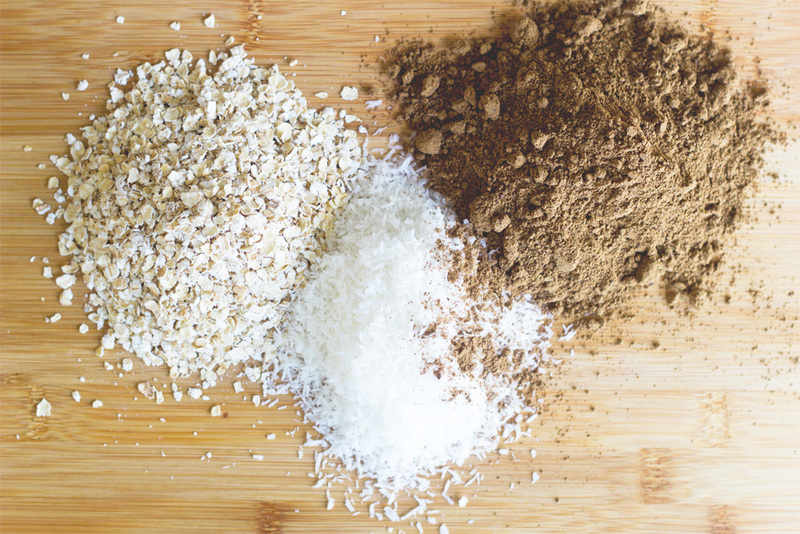 I doubt sugar in any form–coconut sugar, agave syrup, even stevia–is really “good” for you. However, I do argue they can be healthier alternatives to basic white sugar if they have some benefits. 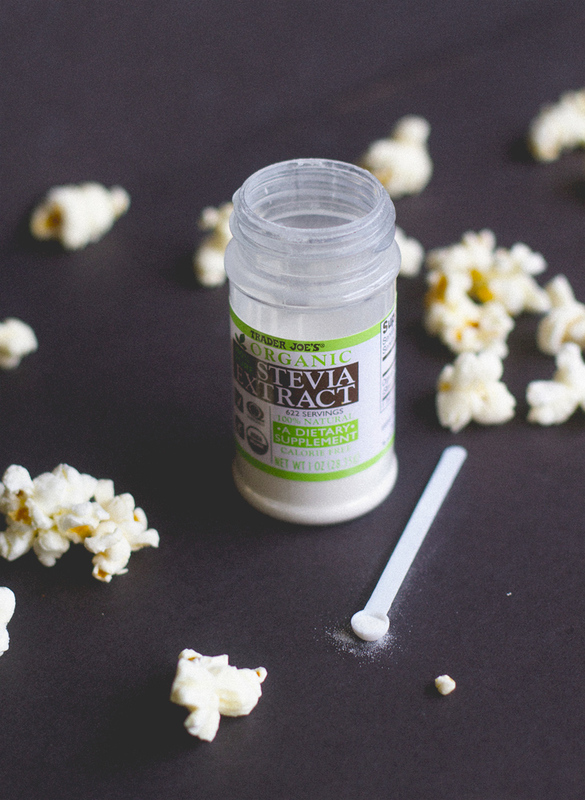 And…of course this Trader Joe’s Stevia Extract does [see some benefits here]! I was a little afraid Ryan would notice the difference since I swapped 1/2 cup of white sugar for 3 tiny spoonfuls of stevia sugar, but he seemed to actually, sort of, almost like it! And, by that, I mean he accepted it. I think it helped that I rebranded it as a “lighter” kettle corn, which it really is. 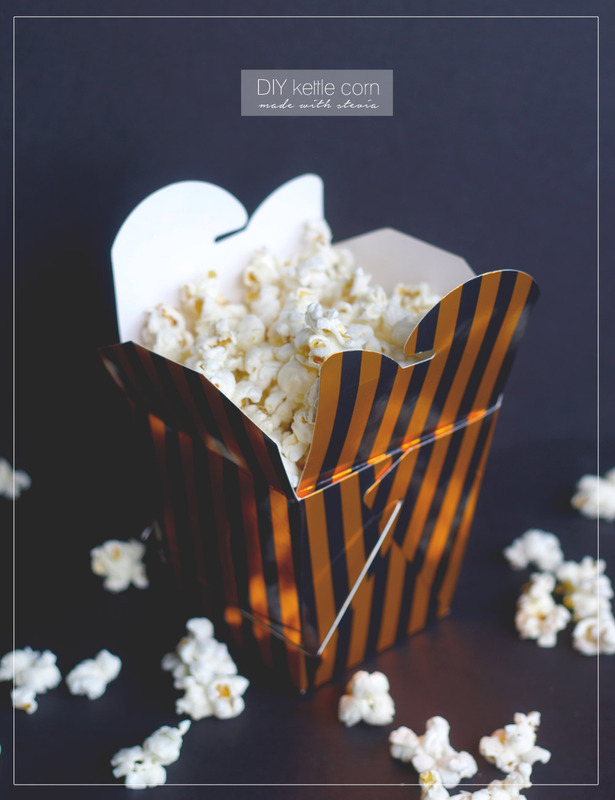 You definitely won’t be getting any sugar-coated, slicked up and saturated kernels with this recipe, but it does have that wonderfully familiar, sweet popcorn flavor. Plus, it’s cheap compared to the junk you buy at the carnival or grocery store. 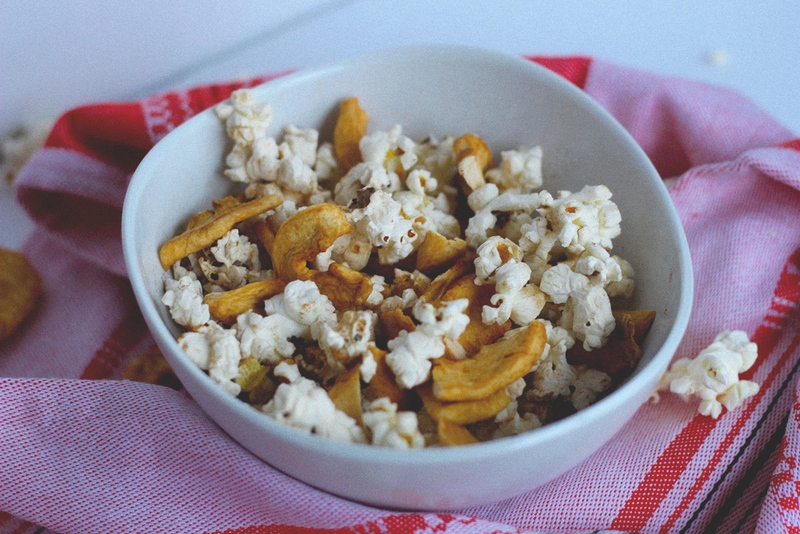 Easiest, tastiest and healthiest kettle corn on the block. Heat coconut oil in a deep pot. Add popcorn kernels and securely cover. Move pot around, to keep sugar from burning. Take off of heat once all kernels are popped (you'll hear it) and voila! Any who, in other news, I’m missing my bananas. Now I know that sounds like it means I have a screw loose, but no. I actually miss my bananas. 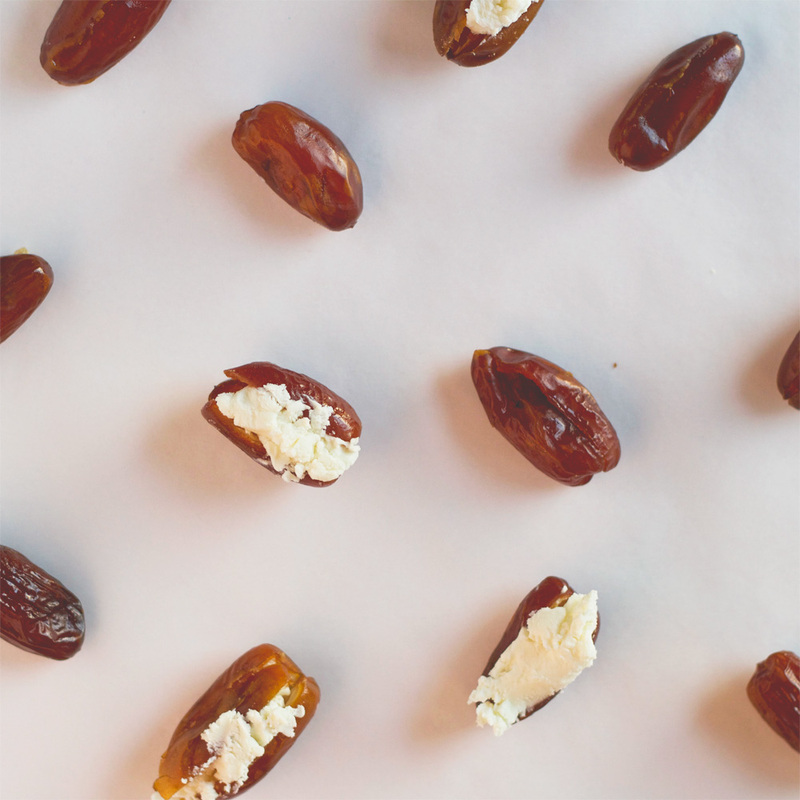 I haven’t had time this week to run to the grocery store and pick up a bunch, and they are seriously the easiest and most filling snack and I hate not having them around my kitchen. I made these last week during “ladies time” and they were definitely the perfect solution to my sweet-tooth. They are uber easy to make. (not pictured) I drizzled honey on top for some extra sweetness and to balance out the almond flour. Lots of healthy things in this little snack recipe though: nuts, a dash of chocolate, fruit and a drizzle of (organic) honey on top! I found this worked best if you froze them and then, right before you are about to eat them, drizzled the honey. Delish. 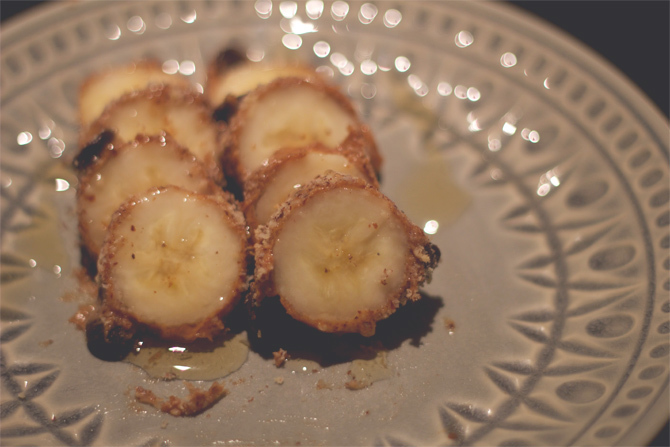 Spread almond butter on banana until completely coated. 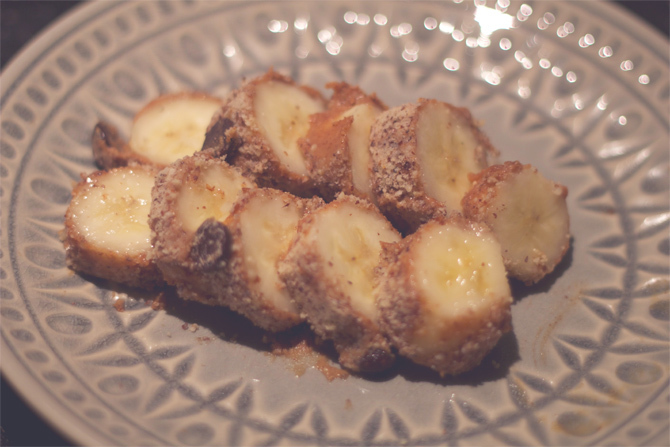 Cut banana in half and roll each half in almond flour. Sprinkle chocolate chips out, and roll in chocolate chips (or press in, if they are having trouble sticking). 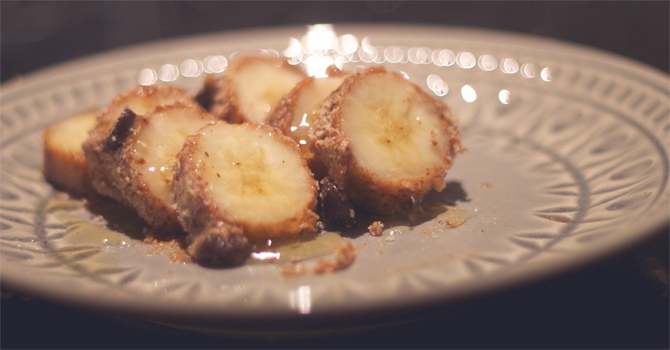 Cut banana up into little roll pieces. Place on plate, in freezer. Take out before eating and drizzle honey. Recommendation: Don't freeze them too long. They can get hard fast and it can ruin the texture. My suggestion? Make them the night you want them. They are easy to make and then you can pop them in the fridge instead for an hour or two and have them as dessert. 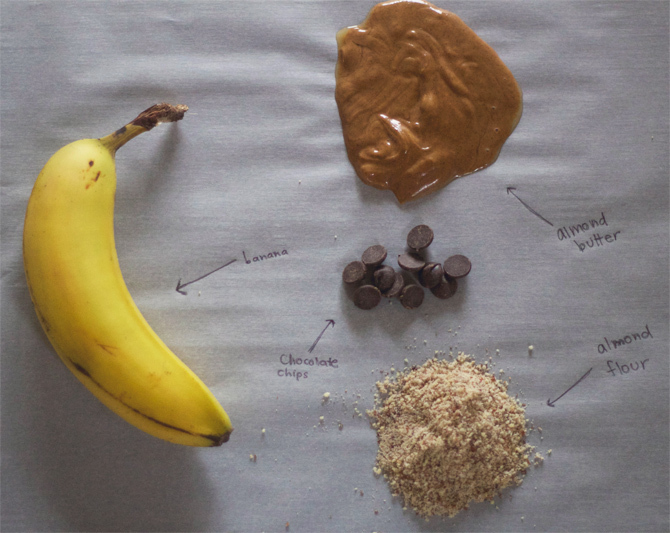 Do you guys have bananas lying around your kitchen (lucky!)? What do you do with them? Sometimes I get the craving for french fries. Or fried carbs. Or basically anything that has the potential to clog my arteries and kill me. But we all have those cravings now and again! And for the most part, I believe in satisfying cravings so you don’t put yourself into some weird mode where you end up bingeing later. However, if you swap out that craving with something a tad more healthy, then why not I say! 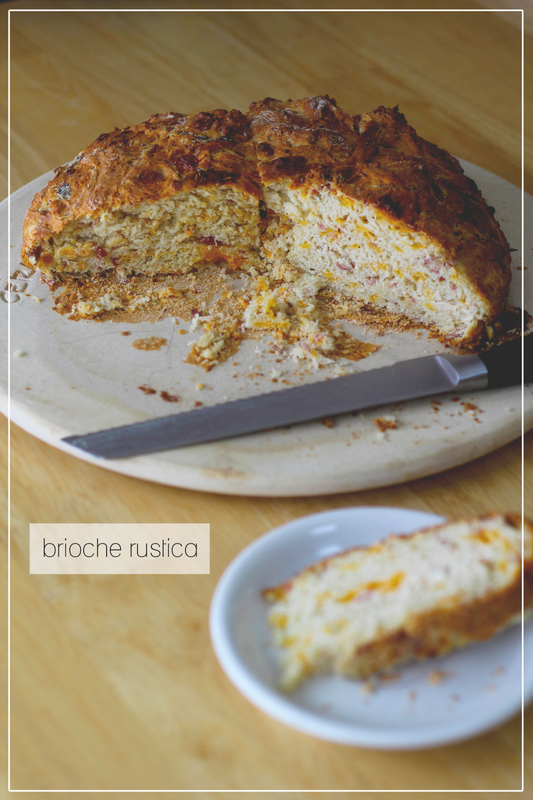 I found this recipe by Delighted Momma and fell in love. 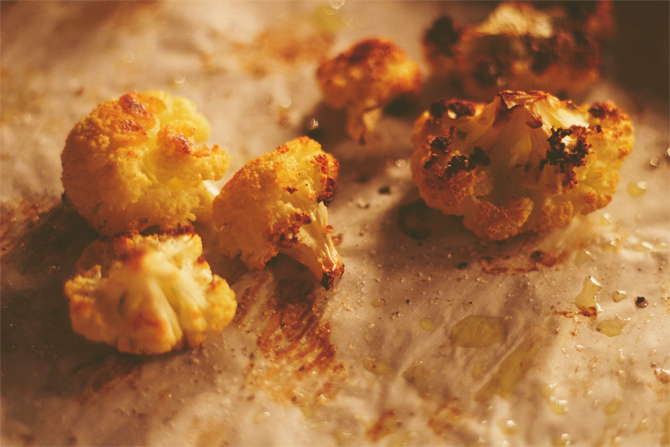 I never even liked cauliflower much before these poppers (and learning to rice the stuff). If french fries had a vegetable cousin, I’m convinced these poppers would be it. 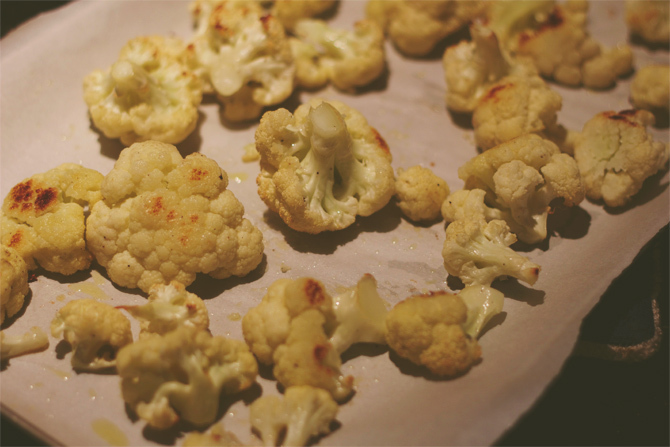 Now I can be a space case, so I only used one head of cauliflower for this recipe. With 1/4 cup olive oil and some guesswork on the salt and pepper. But whatever! The recipe is so easy, there’s not too many ways you can really screw it up. It still turned out muy delicioso for me. (P.S. 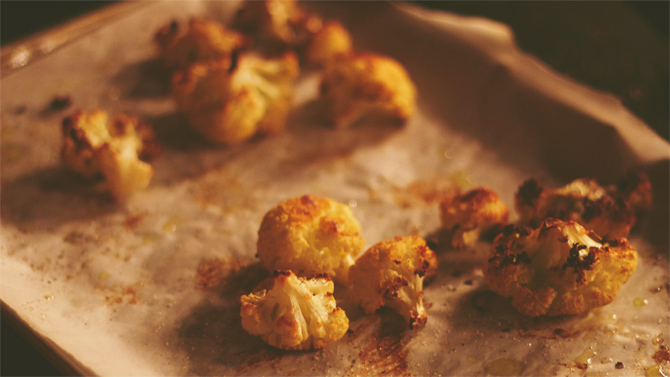 If you are indeed a space case like me and only use one head of cauliflower, there are about 230 calories or less–since you don’t technically eat all the olive oil–per 1/3 of the cauliflower head). I’ve been trying to pay better attention to what my body needs recently. Or at least the good things it’s craving. 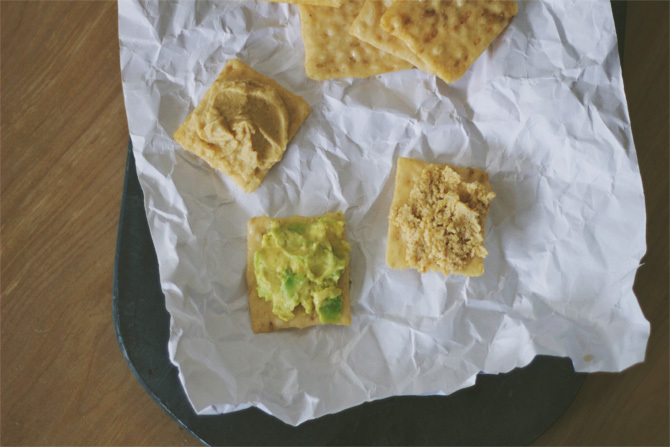 And for some reason, my body was MAJORLY craving for crackers and avocado the other day. Which led to a craving for crackers and cashew cheese. Which, of course, always leads to a craving for crackers and hummus. And thus, this post. Obviously the hummus (Sabra!) and avocado (ripe from Whole Foods!) are easy to buy and prep. Take out (or open up) and spread. 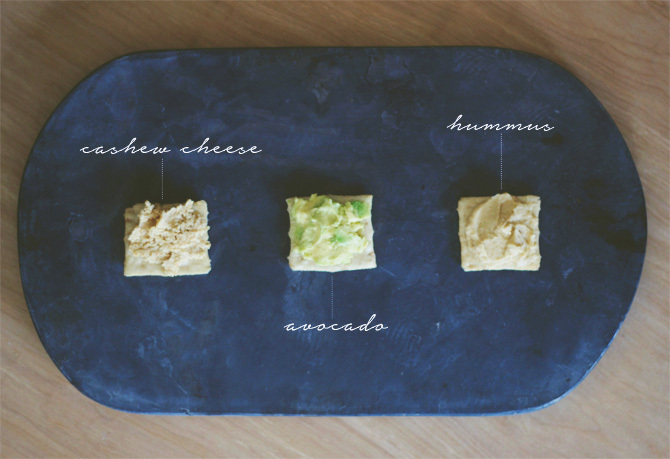 Then, there’s the cashew cheese. But never fear! This recipe is beyond easy to make too (surprisingly). Seriously though, replace the processed cheese spread or veggies draped in icky Velvetta and dip into one of these options. The flavor is still there, but the satisfaction is 10x better (healthy fats and proteins!). 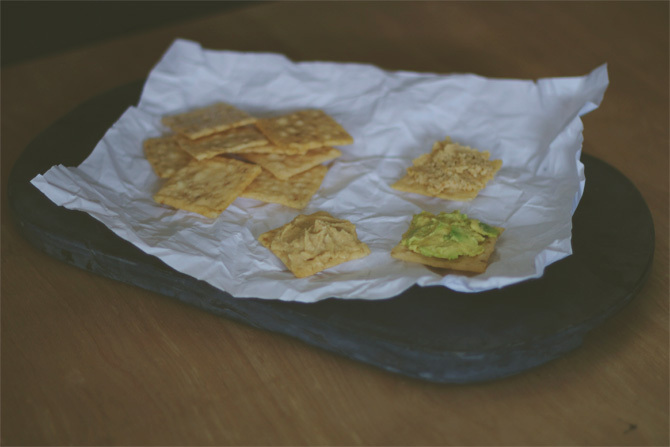 Oh, and I used Back To Nature Gluten Free Crackers here and there were AMAZE. Highly recommend. Soak the cashews 2-8 hours (I soaked mine all day, while I was at work). Drain excess water from cashews and put in food processor with sea salt, black pepper, lemon juice and nutritional yeast. Pulse. Gradually add water until everything is mixed. I kept my cashew cheese fairly thick, but if you want it to be smoother, just add more water.